The NH-U9S takes the series to the next level by providing superior cooling in a small package. Continuing the renowned legacy of Noctua’s award-winning NH-U9 series, the NH-U9S is a premium quality quiet CPU cooler in classic 9cm size. Its asymmetrical design with five heatpipes not only provides even better cooling performance than the previous generation but also improves compatibility. Thanks to its 95x95mm footprint, the NH-U9S clears the RAM and PCIe slots on all Intel and most AMD based mainboards, including µATX and ITX. Combined with its 125mm height, this makes the NH-U9S a highly versatile solution with excellent case, RAM and PCIe compatibility. The included NF-A9 premium fan supports automatic speed control via PWM for outstanding quietness of operation and a second, optional NF-A9 fan can be added for further improved performance in dual fan mode. Topped off with the trusted, pro-grade SecuFirm™ multi-socket mounting system, Noctua’s proven NT-H1 thermal compound and full 6 years manufacturer’s warranty, the NH-U9S is a deluxe choice through and through. The NH-U9S stems from Noctua’s award-winning NH-U9 series. First introduced in 2005, the NH-U series has become a standard choice for premium quality quiet CPU coolers and won more than 800 awards and recommendations from leading international hardware websites and magazines. Like its bigger brothers NH-U12S and NH-U14S, the NH-U9S features a revised, slimmer layout. Whereas the NH-U9B SE2 was 120mm deep with its two stock fans, the NH-U9S is asymmetrically built and measures only 95mm with its single, more efficient NF-A9 fan, thus providing better performance and compatibility at the same time. With its 95x95mm footprint, the NH-U9S does not overhang the RAM slots on current Intel and most AMD mainboards. This gives the user full access to the memory modules and guarantees 100% compatibility with tall heatspreaders or optional memory fans. Please note: Some AMD mainboards violate the 96x114mm keep-out zone specified by AMD, so the NH-U9S can only be used with RAM modules of up to 30mm height on these boards. Please consult our compatibility list for details. 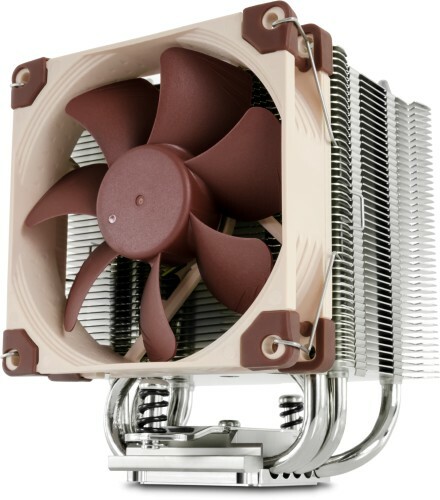 The highly optimised NF-A9 premium fan features Noctua’s proprietary AAO frame as well as sophisticated aerodynamic design measures such as Flow Acceleration Channels, which allows it to further improve the renowned efficiency of Noctua’s previous 92mm models and contributes to the NH-U9S’ superior cooling performance. Noctua’s SecuFirm2™ mounting systems have become synonymous with quality, safety and ease of use. Supporting Intel LGA115x (LGA1150, LGA1155, LGA1156), LGA2066, LGA2011 (LGA2011-0 & LGA2011-3) and AMD (AM2+, AM3, AM3+, FM1, FM2, FM2+), the SecuFirm2™ mounting included with the NH-U9S guarantees perfect contact pressure and maximum convenience on all current sockets. Noctua products are renowned for their impeccable quality and outstanding longevity. 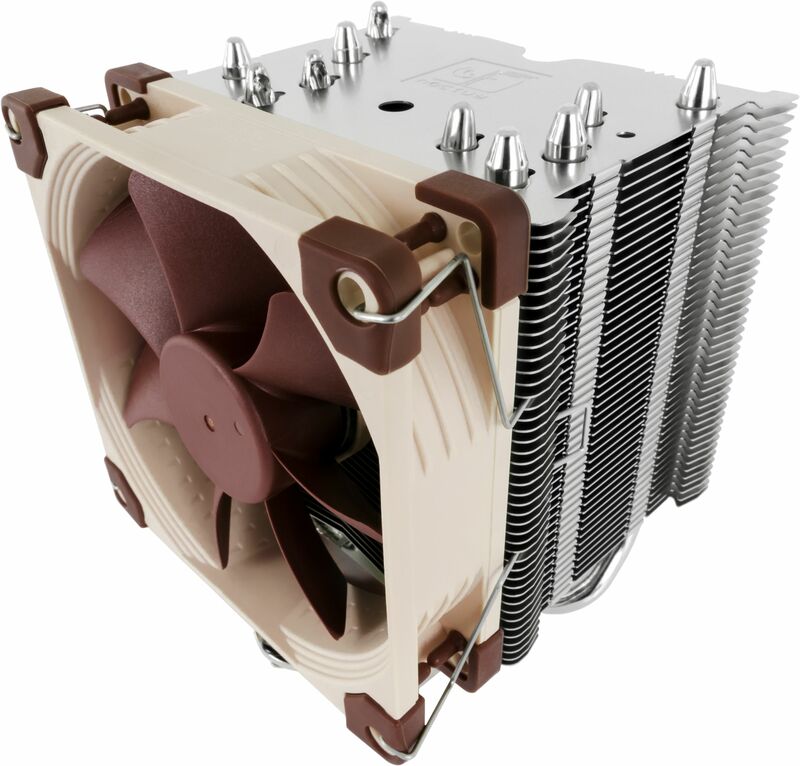 Like all Noctua fans, the supplied NF-A9 features an MTBF rating of more than 150.000 hours and the entire NH-U9S package comes with a full 6 years manufacturer’s warranty.